WellFlorida Council provides annual county health profiles to help residents and community leaders get an accurate overview of the health status of the region and how each county compares to each other and the state. WellFlorida Council is a state designated local health planning council serving 16 counties in North Central Florida: Alachua, Bradford, Citrus, Columbia, Dixie, Gilchrist, Hamilton, Hernando, Lafayette, Lake, Levy, Marion, Putnam, Sumter, Suwanee and Union. The data represents the health status of over 1.6 million residents across these 16 counties and District 3. The county health profiles include data for a range of categories including access to healthcare, lifestyle, socioeconomics, and maternal and infant health. 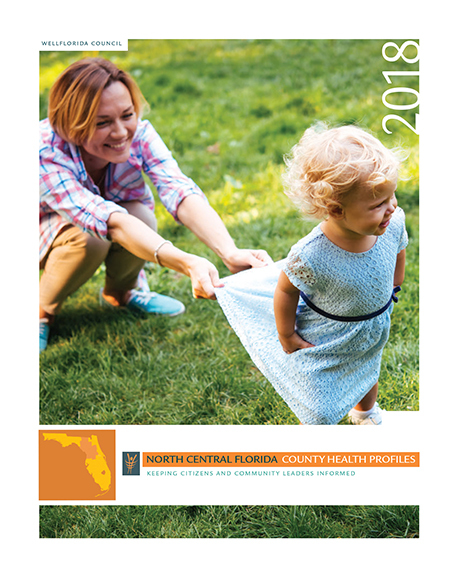 To download a PDF version of the 2018 County Health Profiles, visit https://wellflorida.org/data-reports/county-health-profiles/.